For my last technique, I die cut two pieces of the die cut, then used gesso to place and adhere the pieces on a card panel. Once this dried, I used some acrylic paint to add some color and splatters, and used this as a base to make my card. I the cut out the flowers and sentiment and adhered these on the card. Supplies Used: Doily Circle, A Bunch, Monochrome I had so much fun making these projects, and I hope you had as much fun looking and gotten inspired too!! 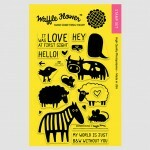 Thank you so much Waffle Flower Crafts, for having me over as a Guest Designer! Hi everyone! It’s Torico again. I have a black and white card to share with you today. In my previous post, I tried to use the tiny accessory stamps in the Monochrome stamp set for my focal point. This time I used those stamps in another way. As you see I used the dotted line stamp for my stems and the heart stamps for my leaves. The flowers were die cut using the Flower Circles and the Flower Circles Inverted Die. I added enamel dots to the center of each flower and drew some dots with a white gel pen. After I stamped the sentiment, I trimmed the panel and adhered it to a black card base along with a strip of black card stock and another strip of patterned paper. I stamped the zebra, cut it out with scissors, and popped it up with foam adhesive. Thank you for stopping by! --- Thank you for sharing with us, Torico! We love how you achieved totally different looks with a single stamp set! Brilliant! Hi everyone! It’s Torico here. I don’t know about you, but I often ignore tiny accessory stamps in a stamp set. So I decided to challenge myself to use the tiny heart stamps in the Monochrome stamp set to create a focal point of my card. I cut out a scalloped rectangle panel using the Lacy Layers Die, then stamped the tiny hearts with four colors of dye inks to create a pile of hearts. I added some white dots to the hearts using a white gel pen. I stamped a mouse on the top of the pile with dark brown ink and stamped a speech bubble with aqua ink. The sentiment is from the On My Mark stamp set. I thought it was a perfect match for the pile of hearts. ☺ Thank you for stopping by! --- Thank you for sharing such a cute and loving card with us, Torico! Find time to create and make something today! A Card, A Sneak Peek + A Winner! Happy friday, everyone! Nina here! I'm snowed under with the preparation of our July release so we will skip this week's Five for Friday post. 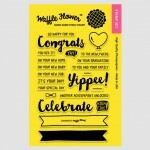 But I still found time to create a quick card for our current Waffle Flower Challenge! You have until Sunday, June 7 to enter! I drew inspiration from the colors and the doily floor mat for my card. Pretty straight forward, isn't it? I heat embossed the zebra and the flower in white on vellum for a soft look. 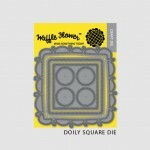 Our Doily Square Die just makes everything prettier! Thank you for stopping by! Find time to create and make something today! Wonder what's the theme for our new release? Think tropical! Here is a sneak peek for you! Join us on the 16th for a full preview of the new products! Hello everyone! Waffle Flower friend Emily is here to share with us today! Emily does amazing things with critter stamps and we are so happy to have her showcasing our Monochrome stamp set! Take it away, Emily! I'm so excited to be a Guest Blogger over at Waffle Flower Crafts! When the Monochrome stamp set as released, I gasped 'cause I love critters, plus these ones were so unique and included some of my favourite types of animals. My husband, my son and I were all born in the Year of the Rat in the Chinese Zodiac! Plus, hubby and I are celebrating our 11th wedding anniversary next month so I used the rats to make a fun card. I always use Versafine Onyx Black pigment ink to stamp anything in black for the sharpest and darkest images. I heat embossed both the sentiment and rats with clear embossing powder. I love that the bit of texture makes them look soft and furry. To create the background, I created a mask and the void is the Atlantic Ocean separating North America and Europe. I stamped rats in six pale colours all over the panel to represent the vast number of possible love interests out there. LOL I added a couple of layers of Wink of Stella to the heart for a bit of shimmer and I also second-generation stamped the dotted line several times to ground the rats. The greenish coloured rats were stamped first in neon chartreuse, followed by silver. I love the unique colour and those particular rats pop a little more than the more muted colours. Would you believe that my husband didn't even notice all those rats in the background? LOL! I coordinated the peachy-pink cardstock on the outer edges of the card with the heart and dotted lines. If you're new to my blog and feel like reading more, I had posted a condensed version of our love story a few years ago. :) Thanks so much for stopping by! We will draw a random winner from all entries for playing along. You can enter as many times as you want! The winner will receive a stamp set of choice! The Waffle Flower Challenge Team will share their takes with you and vote for another winner from all entries using at least one of Waffle Flower Crafts products. The winner will receive a stamp set of choice and join the team for a future challenge! The winners for our last challenge will be announced on Friday, Feb 13. Now, how amazing are these cards?! Thank you so much for the inspiration, ladies! You're the best!!! We welcome all project types and crafters at all levels to join us! Add your link(s) to the Link-up Tool below. Here are some helpful tips if you are new to online challenges! 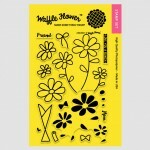 If you used Waffle Flower Crafts products, list the product name in your blog post or photo description. This is especially helpful when you used a product in a clever way that might not be obvious to people. Our team will be looking for them when they vote for the winner, but let's help making it easier for them. We have two winners for each challenge and one of them will be randomly drawn from all entries! Enter as many times as you want. Include the challenge photo and a link to this challenge post so your crafty friends and followers can find us and join the fun too! [inlinkz_linkup id=493899 mode=1] Did you know that you can use your Instagram photos to enter? Learn more here! A Quick Tip: If you share your projects on social media sites, hashtag #waffleflowercrafts and/or #waffleflowerchallenge will make your projects be seen by more people! Hello, everyone! It's May here. Today I'd like to share a couple of one layer cards that I made for Valentine's Day. For my first card, I stamped the stitched heart image from Flutter stamp set after leaving some lines uninked. Then I drew some holes/lines using black pen to look like my heart hanging up from the top. Next, I stamped the tiny hearts from DT Mix stamp set in different shades of pink. I finished it off with the sentiment from Monochrome stamp set. For my second card, I used a masking technique to create a flock of sheep on the bottom of card front. Then I drew a ladder using a ruler and black pen to look like one of sheep climbing up to the heart. Next, I stamped the solid heart from DT Mix stamp set and the sentiment from On My Mark stamp set. That's all for today. Hope you loved my cards and got some inspiration. Thanks so much for stopping by! Happy crafting!